María Guadalupe Araujo (born December 10, 1955), better known as Ana Gabriel, is a Mexican singer and songwriter from Guamuchil, Sinaloa, Mexico. She first sang on the stage at age six, singing "Regalo A Dios" by José Alfredo Jiménez. She moved to Tijuana, Baja California and studied accounting. At age 21, in 1977, she recorded her first song, titled "Compréndeme". During her long career, she has hits in three different genres of music: rock en español, Latin pop, and rancheras. As of 2013, Gabriel had released twenty studio albums, three live albums, and fifteen compilation albums. Three Gabriel albums reached number one on the Billboard Latin Pop Albums, and seven singles reached number one on the Billboard Hot Latin Songs chart, including "Ay Amor", "Es Demasiado Tarde", and "Quién Como Tú". Her work earned her numerous awards and accolades, including a Grammy Award nomination, four Latin Grammy Award nominations, thirteen Lo Nuestro Awards, as well as awards from the American Society of Composers, Authors and Publishers; in 2006, she received the Excellence Award at the Lo Nuestro Awards. In 1987, Ana Gabriel won third place at the OTI Festival, celebrated in Lisbon, Portugal, where she performed an orchestral version of the pop-power ballad song "Ay Amor", which later was released as a single in its album version; it climbed to the top position in Mexico, all-over Ibero-America and on the Billboard Hot Latin Tracks chart for 14 consecutive weeks. In 1988 Gabriel released her first album, Tierra de Nadie, followed by Pecado Original in 1989, which met with some chart success. Her 1990 album Quien Como Tú made her a force within the Mexican music industry. Eight months later, her live album En Vivo showcased her powerful stage act and scored several hits: "Hice Bien Quererte", "Propuesta", and "Solamente una Vez". Throughout the 1990s Gabriel released an album almost every year. A versatile singer, she showcased her talent as an interpreter of many different musical styles, from lambada to mariachi and romantic ballads to pop music. She also honed her skills as a songwriter and a producer, releasing Mi Mexico, a ranchera-influenced, mariachi-backed pop album, in 1991. This unique blend of styles was also reflected in the songs, all written by Gabriel. Her lyrics described strong, active women involved in their love lives, counter to their passive, traditional depiction in older songs. The album also included a tribute to Mexico's most popular singer-songwriter, Juan Gabriel (no relation). Gabriel scored a number-one hit with the duet "Cosas del Amor" in 1991, which she sang with Vikki Carr, a Mexican-American pop singer. The single earned Gabriel a Lo Nuestro Award for Song of the Year in 1992. At the same awards ceremony Gabriel was also named Female Artist of the Year in the Regional Mexican category and Pop Female Artist of the Year; Mi México was named Regional Mexican Album of the Year. In 1993, Gabriel was awarded Best Pop Female Performer at the Lo Nuestro Awards. The following year, she appeared as a guest artist on Plácido Domingo's Grammy-nominated album, De Mi Alma Latina. In 1996 she released the pop-oriented Viven-cias. She followed this with the traditional ranchera album Con un Mismo Corazón in 1997, an album she wrote and produced herself. Of particular interest is her title-track duet with Vicente Fernandez, one of the most prolific and popular ranchera singers in Mexican history. Burr wrote of the duet, "The beauty here lies in the melding of two great voices—Gabriel's husky sensuality and Fernandez's powerful, understated expressions—set against a 25-piece symphony." The logo that identifies Ana Gabriel in her career as a soloist. Gabriel released another live album in 1998, En la Plaza de Toros Mexico, a 30-track boxed set. That same year she traveled to Miami to work with the renowned producer Emilio Estefan, Jr., on her 1999 album Soy Como Soy. The result was a pop-influenced ranchera album that went gold in the Latin music market and helped Gabriel win the Ritmo Latino Music Award for Female Pop Artist of the Year in 2000. With the release of Eternamente in 2000, Gabriel returned to mariachi love ballads, using only guitar as accompaniment. That same year she also appeared with other Mexican music icons in an independence day television special called Viva Mexico, a celebration of Mexican music and history. In 2001 Gabriel released Huelo a Soledad, once again balancing the traditional sounds of Eternamente with sophisticated pop songs, a cappella numbers, and dance tracks. In 2002, Gabriel's platinum-selling album Sagitario was released. In that same year she won the Billboard Latin Music Estrella Award in recognition of her contribution to the Latin music industry, performed at a tribute concert for Vicente Fernandez sponsored by the Latin Music Awards, and participated in the ninth annual Las Cruces International Mariachi Concert and Festival in New Mexico. In December of that year she was scheduled to perform at the eleventh annual Christmas Mariachi Festival in Phoenix, Arizona, but was denied a work visa and refused entry into the United States. In 2017, Gabriel appeared in the multi award-winning documentary film The American Epic Sessions directed by Bernard MacMahon. In the film Gabriel recorded live on the restored first electrical sound recording system from the 1920s. She performed Lydia Mendoza’s “Mal Hombre” accompanied by a large band featuring Omar Rodríguez-López and Van Dyke Parks. Stephen Dalton in The Hollywood Reporter described her performance as “fantastic”. The Grammy Awards are awarded annually by the National Academy of Recording Arts and Sciences in the United States. Ana Gabriel has received one nomination. The Latin Grammy Awards are awarded annually by the Latin Academy of Recording Arts & Sciences in the United States. Gabriel has received four nominations. The Lo Nuestro Awards are awarded annually by television network Univision in the United States. 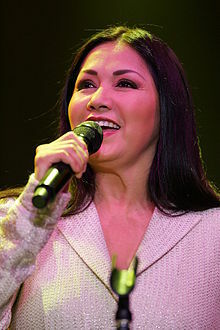 Ana Gabriel has received thirteen awards from twenty-nine nominations. ^ "Ana Gabriel" (in Spanish). formulamexicana.com. Retrieved 2013-11-13. 1989 Awards: Premio Lo Nuestro 1989 (Television). Miami, Florida, United States: Univision. 1989. 1990 Awards: "Lo Nuestro 1990 – Historia". Univision (in Spanish). Univision Communications, Inc. 1990. Archived from the original on October 15, 2013. Retrieved August 22, 2013. 1991 Awards: Lannert, John (May 24, 1991). "Hispanic Music Industry Salutes Its Best Wednesday". Sun-Sentinel. Tribune Company. Retrieved August 16, 2013. 1991 Awards: Lannert, John (June 1, 1991). "Latin Music Finds Harmony In Awards Crisp, Entertaining Tv Program A Breakthrough For Fledgling Trade Group". Sun-Sentinel. Tribune Company. Retrieved August 16, 2013. 1992 Awards: Lannert, John (November 28, 1998). "Ana Gabriel Captures 4 Latin Awards". Billboard. Nielsen Business Media, Inc. 104 (22): 10. Retrieved August 21, 2013. 1993 Awards: Lannert, John (March 30, 1993). "Secada Lead Latin Noms Following Grammy Win". Billboard. Nielsen Business Media, Inc. 105 (10): 10. Retrieved January 3, 2013. 1996 Awards: "Univision Announces the Nominees for Spanish-language Music's Highest Honors Premio Lo Nuestro a la Musica Latina". Univision. March 27, 1996. Retrieved June 11, 2013. 1999 Awards: "Lo Nuestro 1999 – Historia". Univision (in Spanish). Univision Communications, Inc. 1999. Archived from the original on June 23, 2013. Retrieved June 15, 2013. 2000 Awards: "Lo Nuestro 2000 – Historia". Univision (in Spanish). Univision Communications, Inc. 2000. Archived from the original on October 17, 2013. Retrieved June 18, 2013. 2006 Awards: "Recibirá Ana Gabriel la "excelencia" en Premios Lo Nuestro". El Universal (in Spanish). Compañía Periodística Nacional. February 11, 2006. Retrieved June 18, 2013. ^ Lannert, John (January 21, 1995). "Latin Notas". Billboard: 36. Retrieved October 4, 2015. ^ "De mi alma latina". AllMusic. Retrieved October 5, 2015. ^ "American Epic Sessions song list" (PDF). Thirteen.org. Retrieved 2018-02-27. ^ "'The American Epic Sessions': London Review". The Hollywood Reporter. Retrieved 2018-02-27. 1991 Awards: Cromelin, Richard (January 11, 1991). "Grammys--Round 1 : Pop music: Phil Collins' 8 nominations lead the pack and Quincy Jones sets a record with his 74th nod. The winners will be revealed on Feb. 20". Los Angeles Times. Tribune Company. p. 3. Retrieved August 22, 2013. 2005 Awards: "Complete list of 6th annual Latin Grammy nominations". USA Today. Gannett Company. November 2, 2005. Retrieved August 22, 2013. 2006 Awards: Gurza, Agustín (September 27, 2006). "For Shakira, success does translate well". Los Angeles Times. Tribune Company. p. 3. Retrieved August 22, 2013. 2008 Awards: "9th Annual Latin Grammy Awards". Los Angeles Times. Tribune Company. September 10, 2007. Retrieved January 28, 2011.